During a brief day-trip to two small Italian cities, Pope Francis stressed the centrality of the Eucharist to the life and actions of the Church, saying without Christ’s love and self-sacrifice, everything would be done in vain, since everything Jesus did was for others. 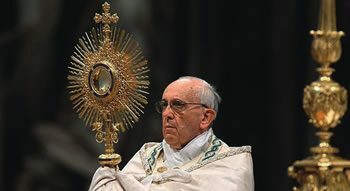 “The Eucharist is not a beautiful rite, but it is the most intimate, the most concrete, the most surprising communion that one can imagine with God: a communion of love so real that it takes on the form of eating,” the pope said April 20. “If love is lacking in those who do the works, if the source is lacking, if the point of departure is lacking, which is the Eucharist, then every pastoral commitment is merely a whirlwind of things,” rather than an act of service. In his homily, Francis said whoever receives the Eucharist takes on the face and mentality of the Lord, who is the bread that was broken for us. And this bread, he said, does not “rise with pride,” but is given to others. He then emphasised the importance of the Word, which he said is a second element that can be taken from the day’s Gospel reading from John, in which the disciples asked themselves “how can this man give us his flesh to eat?” after Jesus spoke about the need to eat his flesh in order to obtain salvation. 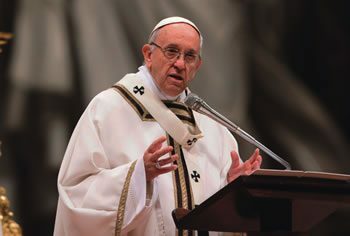 By doing this, “we fall into the error of that people, who were paralyzed by discussion about the words of Jesus, rather than ready to welcome the change of life asked by him,” Francis said, adding that these people did not understand that the words of Jesus were the path to life. Pointing to the conversion of Saul, who later became St. Paul, Pope Francis noted how when Saul was thrown to the ground he was told to rise, go into the city and do what he would be asked. “The first thing to avoid is staying on the ground” or staying “gripped by fear,” he said, stressing that a true apostle of Jesus “cannot simply get along on small satisfactions,” but must always get up and look forward. And, just as Saul was told to go into the city, each Christian is also told to go, rather than staying “closed in your reassured spaces. Risk!” he said. “It’s beautiful to be couriers of hope, simple and joyful distributors of the Easter alleluia,” Francis said, and closed his homily praying that the Word of God would free Christians and help them to rise and go forward with courage and humility. Vatican City, Apr 20, 2018 (CNA/EWTN News).